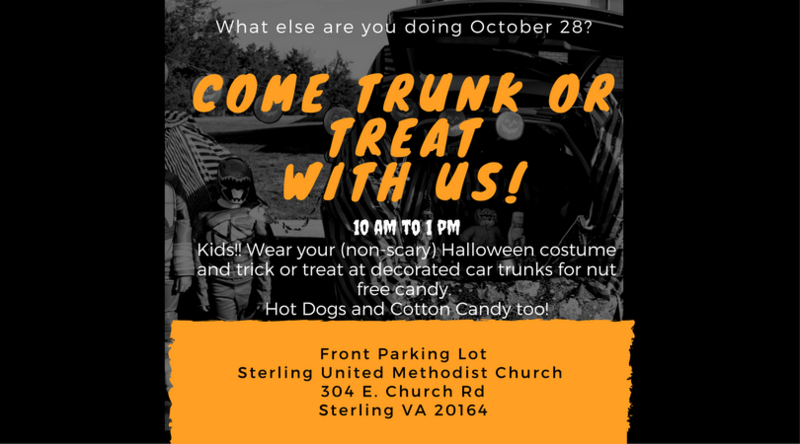 Join us Saturday October 28 from 10 AM to 1 PM to and bring the kids to celebrate Halloween at SUMC with our annual Trunk or Treat event! We invite you to join us in your non scary Halloween costumes and visit the decorated trunks set up in our front parking lot to receive nut free candy. There will also be hot dogs and cotton candy! Sterling UMC is a community church serving our Sterling neighbors surrounding communities. All are welcome to serve and worship with us!